For whatever reason, the water served to clients at the spa is always amazing. A hint of herbal something. Sometimes it’s mint and rosemary, or lemon and thyme or some weird herb that I can’t put my finger on. Lately I’ve come across infusion pitchers all over the place. The last thing I need is another item for my kitchen. So I took the idea and did it in a mason jar with the oddest herb I had in my garden. Lemon Verbena. I haven’t done anything with this herb other than spa infused herbal water. 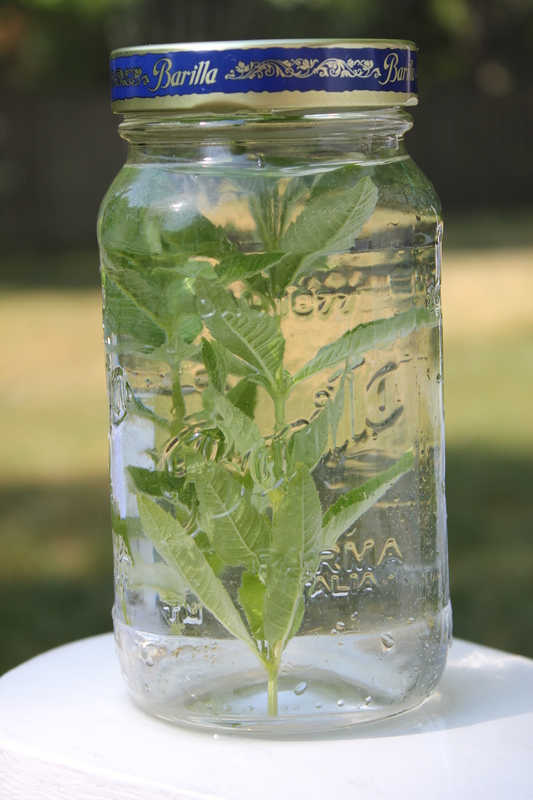 Fill your mason jar with the distilled or purified water and add the herbs. Secure the lid and place in a sunny spot for the day. The longer the jar sits out, the stronger the infusion. Strain the water into a glass with ice and enjoy*. Love the idea, I will try it this weekend!